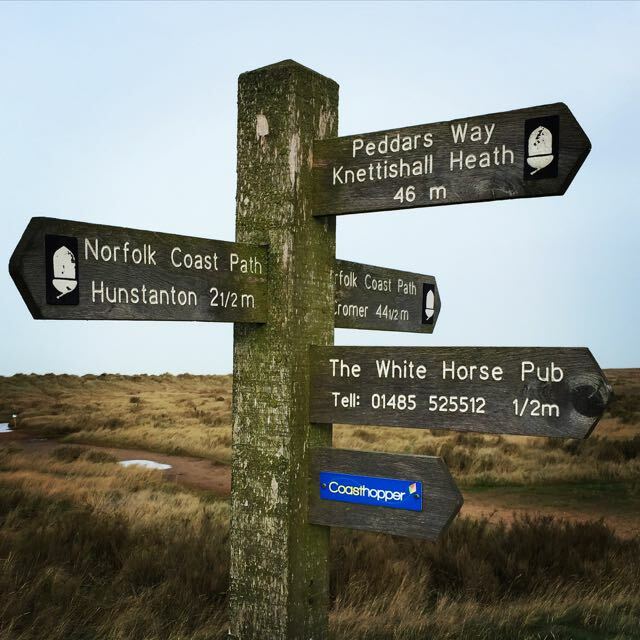 As I sit and write this its two days since I ripped my page(s) from the book hanging from the sign post on the beach marking the end of The Peddars Way and turned for the last kilometre to the finish but still the race is burned vividly into my memory – what a race! For those that have been following my blog, you’ll be aware that I laid out some pre-race objectives. For those that also follow me on social media you’ll be aware that the day before the race I was also having trouble with my right knee following my final taper run. No blisters, although my left shoe was bruising my ankle bone so took a chance and changed into a brand new pair at the half way mark – don’t try that at home kids! First race ever with a crew, who were superb! Race organisation was extremely well executed, well stocked checkpoints and all staff extremely friendly and helpful. Hats off to those who manned the afternoon checkpoints, you were total stars braving those conditions! So that is the high level summary, now onto the detail. First off I should start by saying that the race was fantastic and an amazing experience. Superbly organised and fantastic support from the check point staff, race directors and my wonderful crew! I had some issues, especially in the first half of the race and while I do look back with some sense of regret at what could have been, there is also an enormous sense of pride in how I managed to pull myself through to finish strongly. Plus, and maybe this is a sickness I have, it was superb fun, especially once the ravages of winter arrived. So I apologise if some of this reads a little negatively and is self critical. I’m just trying to convey how I felt at the time. Stick with it though as hopefully it gets more positive as the race goes on. Grab yourself a drink, this could be a long one! I’d learnt my lessons from my last ultra, at least I thought I had, and started my taper a little earlier, putting my last major block of training three weeks out from the race start. The data in Training Peaks was looking promising and I appeared to be recovering nicely. My final week into the race was supposed to be nice and easy, with a couple of 5km runs and some core strength work. I’d been suffering from a cold the weekend before the race, so kept the first run nice and easy. By Thursday the cold looked like it had disappeared, so I decided to introduce some intensity back into my final taper run, in the form of a couple of short hill repeats. All seemed well until half an hour after the run when my right knee started to feel sore. Long time readers of this blog will know that I have previously suffered from knee pain but this tends to be after time off from running, where I loose some muscle strength around my knee cap. It seemed strange that this would happen during a taper, after weeks of high volume. After much nail biting I decided to see how it was was overnight, perhaps it was just one of those aches that comes and goes in a flash. Unfortunately not! The next day it was still there and I was starting to get worried. Was it the same old inflammation which is OK to run on, or was it something more sinister? If the later then smashing 77km of running through it probably wasn’t the wisest idea. I decided the only option was to seek professional advice and Carl, a friend from Ely Tri Club, agreed to take a look. What a star! He pulled, prodded and twisted to confirm that it was probably just my usual inflammation and no ligament damage was apparent. He gave it some treatment and sent me on the way with the reassurance that I needed before the race. Thanks Carl! Game on! All my race kit was packed and ready to go. My wife and two son’s had kindly volunteered to be crew for me on race day, the first time I had ever had this in a race. I’d therefore got everything sorted on the Thursday night as they were heading over to Norfolk the night before to stay with family near checkpoint one. I’d also agreed to go to a comedy gig with a friend in Cambridge on the Friday night, so wanted to be sure all was squared away nice and early. I’d worked out a nutrition plan based upon my success (and slight blip) at the Grimreaper in 2014. I was working on the basis that 300kcal per hour plus a top up from each of the three checkpoints, would be sufficient to see me through without the dreaded bonk. Due to the fact that this was going to be a winter race, I was hopeful that 1 litre of fluid per checkpoint or roughly 500ml per hour would also be sufficient to see me through. I opted to carry an extra 250ml in a soft flask as back-up in case I needed it. The weather forecast was for it to be cold with the risk of rain later in the day. Temperatures were supposed to be above freezing once dawn arrived but with windchill they were supposed to feel just below zero for the entire day. I was unsure as to whether to take my lightweight insulation jacket to the race start and then carry it onto my first meet up with my crew. Clothing wise I planned to go with the mandatory items recommended by the Race Directors, so the jacket would have been an unnecessary luxury. But if we were hanging around at the start it could be useful to keep warm. Decision, decisions! I was planning to carry my Ultimate Direction PB Adventure Vest rather than my Salomon Hydro 5 Set. This was due to the additional volume the UD vest offered but also to give it a thorough race test, to hopefully allow me to further expand my review from last year with some additional feedback. I was also going to use ViewRanger on my phone for navigation if required and had a full set of 1:50 and 1:25 Ordnance Survey maps of the route loaded. I had signed up for the Race Drone GPS tracker as well to allow my crew to find me and friends to keep track of my progress throughout the day. Conscious that I was reliant on the phone for navigation I opted to carry a small reserve battery pack just in case. I also dug out my old second generation iPod Nano for music and podcasts, so again I could reduce the battery demands on my phone. 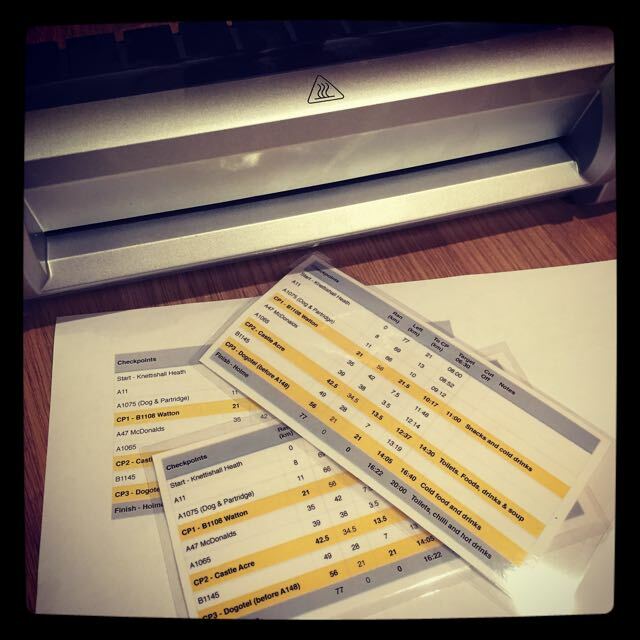 I had created some laminated pacing cards based upon my targeted average pace of 6:30/km. In addition to keeping me on track, especially when in the checkpoints, I hoped it would also act as a useful guide for my crew to know where I was hoping to be at a specific time. This combined with the Race Drone tracker app and some brief text codes we’d worked out between us should hopefully allow my crew to time their arrivals at checkpoints as accurately as possible and avoid them having to hang around unnecessarily. As previously mentioned, I had decided to publicly post my pre-race objectives in the run up to the race. This may have seemed like a bold or even arrogant move but I was confident that my training and current level’s of fitness would make all of these attainable. Before the race started I was extremely confident of hitting my 08:20 target and was also hopeful that I stood a good change of comfortably beating this with a low 8 hour time. How wrong I was! Finally I was gently loosing weight in the run into the race. I hadn’t consciously reduced my calorie intake but it was dropping all the same from a recent high following a work trip to Scotland. My weight was still a little above what I would typically class my racing weight but in all I lost around 2kg in the 2 weeks up the race start. The day of the race dawned bright or rather dark and early at 3:30am. I was driving to the finish and then getting the bus back to the start, hence the very early start. It did mean that my family wouldn’t have to wait for me at the finish should I have issues and not come in to around or even after the cut-off. The late night the previous evening did result in only 3:50 of sleep, although I reassured myself that I never sleep well the night before the race anyway and had banked nearly 8 hours the previous night which is what really counted – or so I hoped! Breakfast consisted of a medium size bowl of porridge with seeds and raisins, plus honey on toast twice, a large orange juice and the obligatory espresso or two. This was further supplemented with a couple of bananas and a cereal bar in the drive to the coast and return bus ride back to the start. For most of the previous day and through to the start, I was gently sipping on water with added electrolytes. I’d experienced some cramping in my feet during the taper week and this, combined with my plan to try and keep the water I need to carry to a minimum, meant that I wanted to be sure I was fully hydrated as we started the race. I arrived at the car park with ten minutes to spare, dashed for a quick loo stop, threw on my kit and jumped aboard the bus. The temperature was a couple of degrees higher at the coast than in Ely, so I took a punt and left the insulated jacket behind in the car. First correct decision of the day as although it was cold at the start I was warm enough in the kit I had on and we didn’t have to wait very long before we were running. My knee felt a little better following the treatment from Carl the previous afternoon, however I decided to start without either a knee or patella strap and see how things progressed. They were in my race vest just in case I needed them. It was a long, extremely warm but uneventful bus ride back to the start. 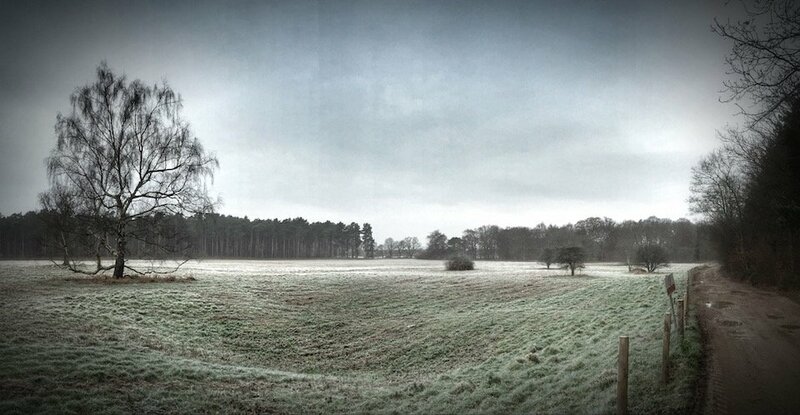 As we approached the car park at Knettishall Heath the sun came up and it started to gently snow. There wasn’t much time to think about it though as once off the bus it was a quick dash to find a bush for a final comfort break, the race briefing was called and we were off! From the moment we started I knew something was up. Running just felt wrong, it felt like such hard work, almost like running through treacle. I was moving over easy ground at what should have been a very comfortable pace for me but it just felt like a struggle. Looking at my watch I could see that my heart rate was 10 beats higher than I would have wanted to be, confirming it wasn’t just my mind playing tricks. “Give it time” I told myself, “it will settle down, its just pre-race nerves” – not that I had felt nervous. I was running with a small group of four other runners, exchanging words occasionally but generally pretty quiet, all contemplating what laid ahead I guess. The pace continued to be nice and easy but as the kilometres ticked by I continued to find it hard work and my heart rate stayed up. It finally got to the point where I felt like I was struggling to hold onto the back of the group. This was ridiculous! I was on terrain I was familiar with, travelling at a slower pace than I would be running in a training run wearing the same kit. However rather than feeling like I was floating across the ground, I felt like I was crawling up a long sticky hill. Eventually we crossed the A1075 onto ground I was very familiar with. 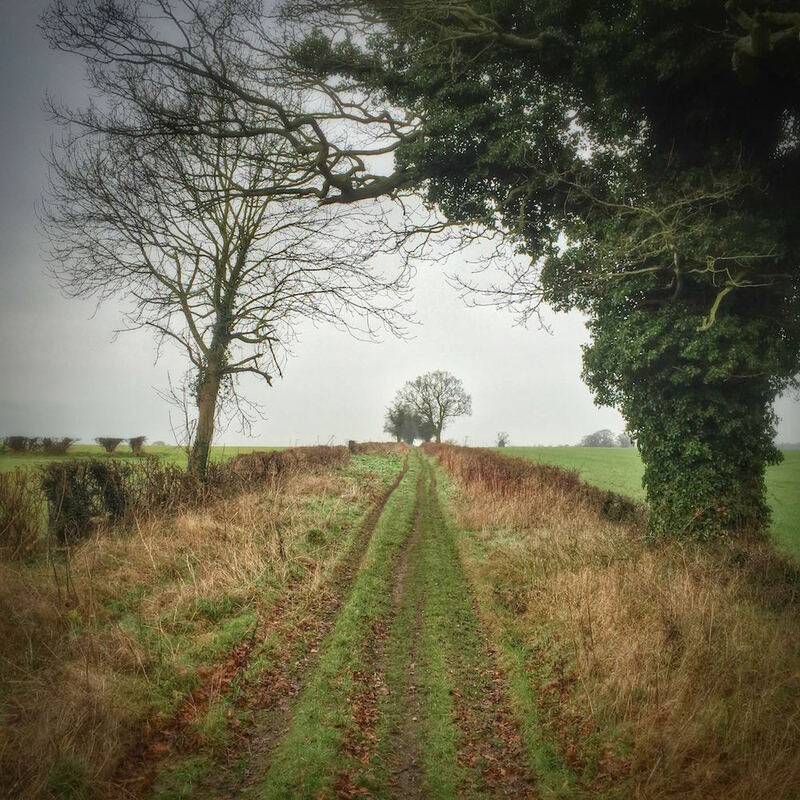 This was the area I grew up in and this part of the Peddars Way had been used throughout my teenage years for sponsored walks, Duke of Edinburgh’s Award training and Scout hikes. I had even run this stretch on Boxing Day at a much harder pace and had felt ten times easier. I decided that enough was enough and I needed to break the cycle. I was wondering whether I was overheating a little in my jacket, which in turn was causing the issues I was experiencing. So I drifted to the side of the track, let the group I had been running with disappear off into the distance and proceeded to remove my jacket. Hopefully this approach would a) cool me down and b) remove the dangling carrot of the group I had been running with from before my eyes. More people ran past and I picked my spot and dropped back into a gap so I could run on my own. Out came the iPod, time for some mental distraction. Rather than my usual choice of podcasts, I opted for music to try and lift my spirits. Hopefully things would pick up between here and the checkpoint and I could get my race back on track – how wrong I was! The next thing I became aware of was the outside ankle bone on my left foot feeling a little bruised. It appeared as if the edge of my shoe was knocking against it on each foot strike. Strange I thought, I have over 450km of running in these shoes without a hint of a problem, what is going on here? I stopped a couple of times and adjusted the lacing but still it continued. Oh well push on. About an hour into the run I decided to try and eat something and get some fluids in, in a vain hope that that may improve how I felt. Normally I have no issues eating my typical running food of Nakd and Clif bars but today while they didn’t make me feel ill I didn’t have the appetite to eat. I forced a Nakd bar down with some water and pushed on. This had the added bonus of giving me a minor stitch shortly afterwards, at least that was something new to focus on! Then it happened, my quads started to tighten up! I don’t remember the precise point but it was a few kilometres shy of the first check point (probably around 17km) that I first became aware of it. A gentle burning in both quads, not enough to stop me running but uncomfortable to be sure. Now with 17km to go I would have expected to feel this but with 60km to go it was a bit of a concern to say the least. My training runs obviously regularly clock over 17km and I had never experienced this before, so it was a total shock to me. The first checkpoint was approaching and while I knew I was still ahead of my target time for a 08:20 finish, I also knew I wasn’t far enough ahead to bank the time required for the hillier challenges North Norfolk would offer later in the day. At this point I knew my pacing card was out of the window and from now it was just a case of getting to the finish in whatever time it took. I ran into the checkpoint looking to swiftly reload and move on. Unlike the other checkpoints, this one wasn’t that easily accessible and my crew had decided to meet me just outside Little Cressingham some 4–5km further up the road. So I topped up my water bottles, drank some fluids, grabbed some food and pushed on. Food consumed during the run leg: 2 Nakd bars, 1 Cliff bar and 1 litre of fluid. Food consumed at checkpoint: Half a cup of flat coke (trying to lift spirits with sugar and caffeine), two cups of water, 2 Jaffa cakes and a handful of jelly babies carried onto the next run leg. Time at checkpoint: Aprox 9 minutes – obviously not as swift as hoped! I walked the first 3–400m from the checkpoint, getting down the food that remained in my hands, ensuring my race vest was back on correctly and everything was ship shape for the coming 21km. Starting to run was painful in my quads but once moving the discomfort was manageable and I looked forward to seeing the family in a few kilometres. During the first leg I had pretty much run straight through, including up all the inclines, which were barely noticeable. Busy searching for a reason why my quads were playing up I wondered whether that may have been the cause. In reality I have run those hills (if you can barely call them that) a number of times before with no reaction and knew I was clutching at straws. The first major incline however was coming up and I vowed to stay true to my race plan of route marching the uphills when they came. Truth is I can actually walk uphill as quickly as I can run them at my typical ultra pace, so it makes sense, gives the muscles a break and usually helps saves the quads. With the quads on their way out it was now a case of damage limitation and managing them to The North Norfolk Coast. Annoyingly where I was meeting my crew was at the top of this first incline, so I knew there would be some concern as I appeared around the corner walking (and there was) but vanity had to be put to one side. I was playing the long game! I saw their cars parked from a couple of kilometres away and it definitely put an extra bounce in my step to know I was going to see some familiar faces shortly. As I rounded the corner I could see my eldest son (5) bouncing up and down with excitement and it put a massive grin on my face. I marched up the hill towards them and they came down to meet me. “Are you OK?” was the obvious first question, and I confirmed I was but felt off my games and my quads were shot. “How is your knee?” was the next question. Interesting question as once the quads kicked in I hadn’t felt the knee at all, one positive I guess! I didn’t stop here, and had pre-warned them that was my plan. I grabbed my visor from my wife which I had texted ahead and asked for. I also asked that they bring my spare shoes to Castle Acre with them as the ankle bone was getting sorer as time ticked by. A few high fives with the boys and a smile and wave over my shoulder and I was pushing on. Next stop Castle Acre! Seeing my family was a real boost. The majority of them were all there, my wife and two sons, both sets of parents and my sister and her partner. Part of me felt guilty that they should be out on such a cold day, conscious that ultra running is not necessarily the most spectator friendly of sports. As it turned out they all stayed for the entire day and were there to greet me at the finish. This was the first time I had ever raced with a crew and boy does it make a difference to morale, although as I would learn you probably need to be more disciplined at the checkpoints. The next few kilometres were on tarmac undulating across a couple of valleys. On the steeper uphill sections I walked and despite everything I was still making good pace but knew that with the terrain to come I wasn’t going to be getting any quicker. A long time family friend was taking photos at the next junction which was great to see, although I clocked him at the last minute and just said hi and pushed on. Fortunately I would see him again a few miles later so stopped to exchange a few words before pushing on. I was running on my own, with people a few hundred metres in front and behind me. Eventually we were leap frogging each other as they stopped to take on fuel and walked for a bit. We all exchanged a few words but no one seemed really chatty, which was to be expected with the distance we still had to cover. As we entered North Pickenham we left the road and got back onto trail (32km). It was at this point that the quads really kicked up a gear and I started to fear I may even have to walk on the flat. I eventually did slow to a walk and took on some fuel but soon pushed on again telling myself “I’m going to do this if it bloody kills me!”. All the months of training building up to this and the fact my family were here made me determined to push on through. I was focussing on checkpoint to checkpoint, to keep the enormity of the distance out of my mind. So as the miles ticked by the pain became manageable. I could run with some discomfort and as before it was the transition from walking to running that was most painful. I was still feeling off my game and like I was running through treacle. All in all I was in a bad place but I was still moving forward and was looking forward to arriving in Castle Acre. As we crossed the A47 we could see the darkening skies up ahead, which didn’t bode well for the afternoon. The run into Castle Acre itself was all on tarmac, which was a little tiresome and I hooked up with a Guy who had done the race the previous year and who made the same observation. As we closed on Castle Acre I pushed on, keen to get to the checkpoint, see my crew and get some food. It started to rain slightly as I ran into the village and was confronted by the final hill up into the village centre. Great I thought, second time they see me and I will be walking again! However I needed to stick to the plan so walked up to the medieval arch and then ran into the village square to be greeted by the family who directed me to the checkpoint which was under cover. Fabulous! Castle Acre was over half way, only 34.5 kilometres to go now. Despite how I felt I was confident now I could finish the race, little did I know what was to come. Hot soup and coffee was offered and as with all the checkpoints they were extremely well catered and staffed with really friendly helpful people. Nothing appeared to be too much trouble. First order of the day was to change my shoes. I had already decided to take a risk and put on a brand new pair of Brooks Cascadia’s that I had never worn before. The other option was my Brooks road running shoes and while the reccie had reported firm ground underfoot I suspected off road shoes would be the order of the day. The original plan had been not to meet my crew again until the finish after Castle Acre, however I asked if they could come to the next checkpoint which was only 13km up the road. “Sure” they all agreed, pleased to help in anyway they could – what a team! Right that’s it, I’ll wear the Brooks Cascadia’s from here to the next checkpoint. If they are fine I will push on to the end with them but if there is any doubt I will switch back to my Salomon’s. A quick comfort break and some more food down my neck and I was ready to push on. Just then I noticed it had started to lightly snow, so I also grabbed my windproof jacket from my crew. That would easily hold the snow at bay and I didn’t want to have to chuck my waterproof back on again, remembering how I had ditched it for overheating in the morning. While sorting my vest out I also dumped my spare battery for my iPhone as it had plenty of charge to the end. I reloaded with some extra food but as with the first leg I had little appetite so wasn’t eating as often as planned. This concerned me a little as I was way behind on the nutrition strategy I had set myself but despite the treacle feeling, I didn’t feel like I was lacking energy so put it to the back of my mind. Then the fun really started! Food consumed during the run leg: 2 Nakd bars, 1 Trek Protein bar, Chia seeds trail mix and 1.25 litre of fluid. Food consumed at checkpoint: 2 cups of soup, 1 cup of coffee, handful of crips and a handful of jelly babies carried onto the next run. I only managed 20 metres before I had to stop and re-tie my shoes, not surprising considering this was the first time I had ever ran in them. Was I making a huge mistake! I followed another runner out of Castle Acre but over the next kilometre it went from gently snowing to a full on blizzard. As we left what little shelter the village offered and moved out into the fields, the wind got up and the temperature plummeted. This was not looking good! I had no choice but to stop and get my waterproof jacket on. My windproof was never going to be enough. I guess at this stage I was fortunate to be able to draw on my winter and alpine mountaineering experience and these decisions were like auto pilot. I was definitely having flashbacks to standing on top of the Cairngorm Plateau at the top of a winter climb! It was tricky in the wind but the waterproof was thrown on over the windproof – who cares about overheating! – and my windproof gloves were dragged on over the liner gloves. I’m never one to run with my hood up but that was straight on and tightened up, time to hunker down and see this storm out. I got my pack back on and started moving, I needed to get warm. I stated running but by now my hands were soaked and I was struggling to warm them up. I tried all the tricks I knew to try and get the blood flowing through them but nothing seemed to work. Fortunately I had also packed a pair of primaloft mitts. They weighed next to nothing and I had decided they were worth carrying as I had suffered from cold hands on a run a few weeks earlier. The storm was getting stronger and my hands were getting colder, so I decided the mitts needed to come out and I dived behind a hedge to try and find some shelter. It was a real struggle to get the vest off my back as my fingers were totally numb and for the first time I seriously considered back tracking to the checkpoint at Castle Acre for assistance. I eventually got it off and the next challenge was to get into both the vest and dry bag to find the mitts. All the time I was standing there I was getting colder and colder and my fingers were getting worse by the second. Was this the end of my race!? Finally I managed to get in, found the mitts, threw my wet wind proof gloves on the ground and pulled them over my hands. I then stuffed everything back into the vest, threw it on my back and headed out from behind the hedge back into the storm. I had to get moving! Over the next few miles I ran as much as I could and route marched the hills. Slowly the warmth started to return, my fingers thawed and the snowed eased a little, I had made it through the worst. There was another long haul of tarmac out of Castle Acre, probably 8–10km in total once you include the drag into Castle Acre itself. Definitely not the prettiest section of the route but with the storm raging and the need to get warm it was great to not have to worry about what was underfoot. The shoes felt fine but my feet were soaked through. Would that cause blisters or issues over the remaining 30km? Finally we left the tarmac back onto trail and the slip sliding began. The snow was settling on the ground but unfortunately the ground was not frozen, snow and mud do not make a good combination and you had to carefully pick you way along the track, moving from left to right to find the best line. By now I was feeling warm and in control of the situation and then something amazing happened, the treacle sensation disappeared! Yes my quads still hurt like hell and it was still slippery underfoot but I finally felt like I wanted to run and more importantly race! “Where have you been for the last 53km?” I mentally asked my body. There was only 24km to go but better late than never! I pushed on and managed to pass 4 people over the next few kilometres but before I knew it the next checkpoint had arrived. I looked for my crew but they were no where to be seen, had I been that quick? No bother, my feet felt fine, my body had now joined the game so I could just push on. The weather was still miserable but the crew at the final checkpoint were on top form. Hot chocolates were offered and quickly consumed, water bottles were also quickly reloaded. I was getting cold so wanted to push on and pulled out my phone to text my wife to let her know I had been through the checkpoint. The only issue was that with the falling snow it was a nightmare to get the touchscreen to register and it took me an age to first unlock the phone and then start to attempt to type the message. It was at that point they arrived, having been stuck behind a slow driver. Now with hindsight I should have stuck to my guns and said a quick hello and pushed on. I’m not sure whether it was guilt that this would seem rude after I’d asked them to make the effort to get here but either way I hung around and decided to change my socks. It was great to see everybody but with hindsight this wasn’t entirely necessary. Nice as warm dry socks were, within minutes they were soaked too and as such there was no real benefit, other than the obvious morale boost of seeing the family. 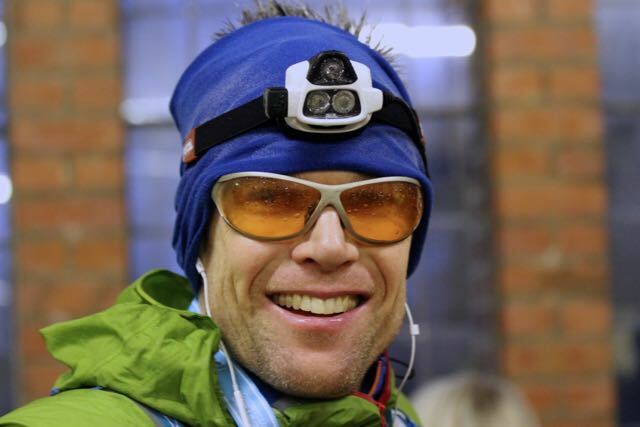 Watching everybody I had overtaken in the last few kilometres leaving the checkpoint, combined with the cold seeping back into my body spurred me on. Just a half marathon (21km) to the finish I thought, so bade my crew farewell and headed back out into the snow. Next stop The North Sea! This was it, the homeward leg. I would finish! The cold had really sunk into me again, so for the first few kilometres I focussed on getting warm and sat in behind a couple of guys, exchanging the odd word or two from within my hood. Once I had warmed up I realised the treacle feeling was a distant memory and that I could push harder than the current pace – game on! I moved on from the two guys I had been running with and ran at my own pace. Quads still sore, so walking the steep uphills as before, although I was now running up the gentler inclines too. Quads be dammed, this is a race! The snow eased and the sun actually tried to come out, all be it for about 2 minutes before the snow and cloud returned. The wind was still strong and the air really cold, so I remained hunkered down inside my jacket. 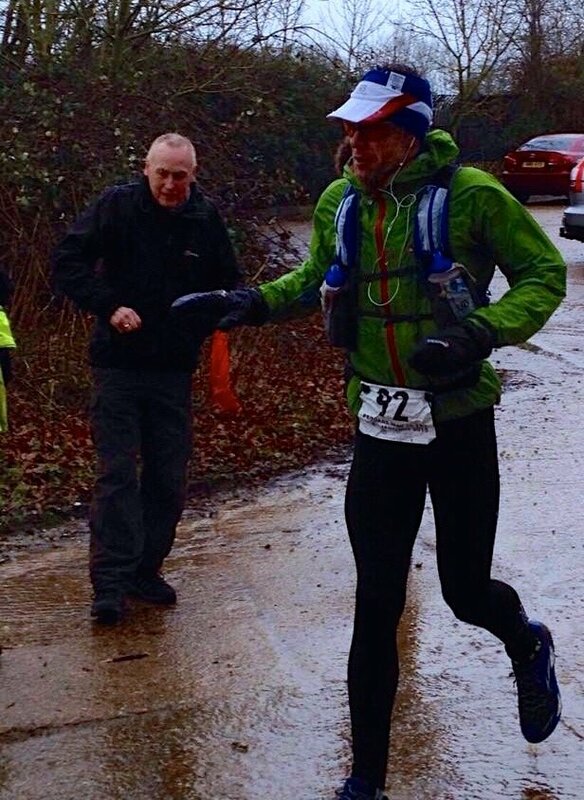 My mitts were by now soaked through, as were my feet but I was warm, moving forward and looking forward to finishing. At this point I checked my watch for the first time since before checkpoint one. My original target of 8:20 was long gone but if I pushed there was still a chance of finishing before it was totally dark in under 9 hours. That was the last time I looked at my watch. From here on in it was all about running by feel, as pretty much the entire race had been to be honest. I would push as hard as I could and give it all between now and the finish line. If I came in just over 9 hours then so be it, at least I would know I had given it my all. Over the next 10km there were lots of hills and mud but I managed to pass 6 people before eventually ending up on my own with no one in sight in either direction. My quads were still sore but I was moving well, walking the steeper uphills and running everything else. That’s it I thought, my finishing position is set – unless someone appears moving quickly from behind – now its just the clock I am against. With about 8km to go you caught a quick glimpse of the sea before plunging downhill into the village of Ringstead. While here I stopped to pull out my head-torch as the light was fading and I didn’t want to have to be fumbling for it in the final kilometre or so. Was I going to make my 9 hour target? It seemed like a long haul up out of the village, although in reality it was only a few hundred metres. I turned off the road back onto the trail and with 4km to go was confronted by the view of the coastline and the North Sea spread out before me. It was at that point that the enormity of what I had achieved struck home. This morning I had been standing in Suffolk on the start line of the race. Now here I was at the North Norfolk coast and despite all that had gone before was running and feeling strong. I pushed on down a winding trail towards the coast road, when all of a sudden another runner appeared before me out of no where struggling with the mud. We exchanged a few words as I passed but I was focussed on the clock and pushed on, apologies if I appeared rude! I crossed the coast road and hit the beach road for the run towards the finish. 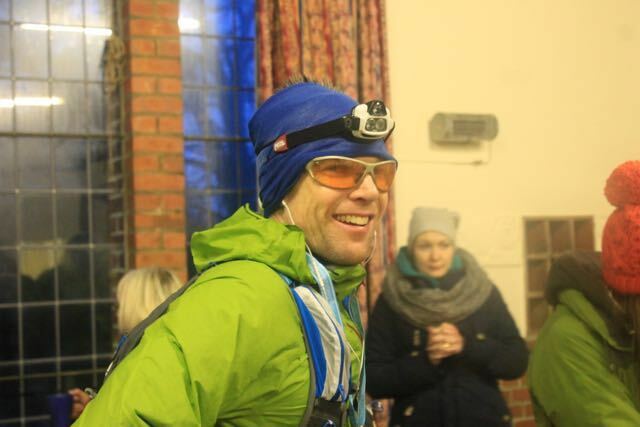 This year the organisers had setup the finish in the local village hall, so they could provide hot food and changing facilities – great foresight! 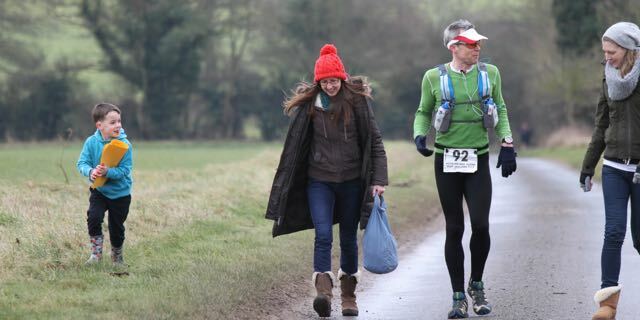 However to keep the race true to its name, they had taken a leaf out of the famous Barkley Marathon in the United States and had left a book at the signpost on the beach marking the end of the Peddars Way. We were all required to rip a page out of that book and return with it to the village hall as proof we had been to the beach. Having reccied the layout of the village and the beach with the family a few weeks previously I knew I still had a couple of kilometres to run. The first down to the beach itself and the second back to the village hall. I was focussed on running as hard as I could while holding enough in reserve to a) get across the sand on the beach and b) back to the village hall. This is not the point of a race that you want to totally blow up! I passed one guy running back the other way a few hundred metres from the beach and congratulated him. Too far ahead for me to hope to catch him. Dam you body why couldn’t you have got involved sooner! As I approached the beach my Dad and Matt where a welcome sight waiting at the end of the road. A quick cheer of encouragement from them and they jumped in the car, obviously heading back up the road to warn the rest of the family waiting at the finish that I was on my way. I hit the sand and was confronted by a small bank which I duly walked up as I was worried running it would deplete my final energy reserves. From there I could see the signpost and the book hanging in a polythene bag. I ran to the bag but in the wind it had tangled up and my cold wet fingers struggled to open it. I eventually got in and again struggled to grip the pages of the book, eventually ripping 4 or 5 out at once. Oh well, that’s proof and some back up! I threw my mitt back on, screwed the paper into my hand and headed back into the gloom. I passed the runner behind me coming over the bank, “finish here we come” I said and pushed on for home. I didn’t know what the time was but the sun was down and the light was failing fast, so I knew I was close to 5pm. I took the turning into the village and kept the pace up. There was still 500m to go and the road twisted this way and that and still the village hall wouldn’t appear. Finally I rounded the corner and saw the lights of the village hall and all my family standing outside cheering. My wife and two sons ran towards me and for a moment I thought my eldest wanted me to pick him up, could I manage that!? “Run with Daddy?” I asked, “Sure!” was his enthusiastic reply. As I approached the Village Hall the memories of what I had been through that day and the enormity of what I had achieved hit home again. “Where do I need to go, where is the finish?” I called as I approached the village hall. My son led me around the corner and I plunged through the door, into the bright light and the round of applause from those inside. I had finished! I gripped the desk, gasped out “number 92” and let the day wash over me. Slowly I removed my mitt and stopped my watch. 08:54, I had made it and beaten the 9 hour target by six minutes! Food consumed during the final run leg: 2 Nakd bars, 1 pack of shotbloks and 1 litres of fluid. So that was it, race complete! On entering the hall and after being given my medal and t-shirt, the first thing I did was look for a seat to sit on and reflect quietly on the day. It was great to have my family there to laugh and joke with and our eldest son was so excited it brought a smile to everybody’s faces. The crew at the end were amazing, very attentive and quick to produce warm drinks and food. My appetite was still non existent, which is pretty normal for me for at lest 12 hours after an ultra marathon. However I was extremely cold and struggling to warm up, so I got the food and drink down to help with that process. I changed into dry clothes, throwing on every layer I had but still I was struggling to warm up. Eventually I said my farewells and thanks to the organisers and retreated to the car for my jackets and the car heaters! The following morning my quads were extremely sore and stairs were a total nightmare. My ankle bone was also a little bruised from the earlier part of the race, as was my lower back, which I guess was from my vest, although have no recollection of that during the race. I was also struggling to keep warm and was constantly having to throw an extra layer on. With reflection I was proud of my race, especially how I coped with the various curve balls that were thrown my way. It was great to be able to share the whole experience with my crew and I was amazed with how they enthused about the event and how they enjoyed it the whole experience, especially being with me at the end. I cannot thank them enough for all their efforts and patience with me, sorry if I was a little short at times. However I would be lying if there wasn’t a touch of disappointment to and frustration. The treacle feeling (I have to come up with a better way of describing this) combined with my tight quads totally scuppered my race plans from the word go. The biggest frustration is a total lack of understanding as to what caused these. Was it a poor taper? Lingering effects of my cold? 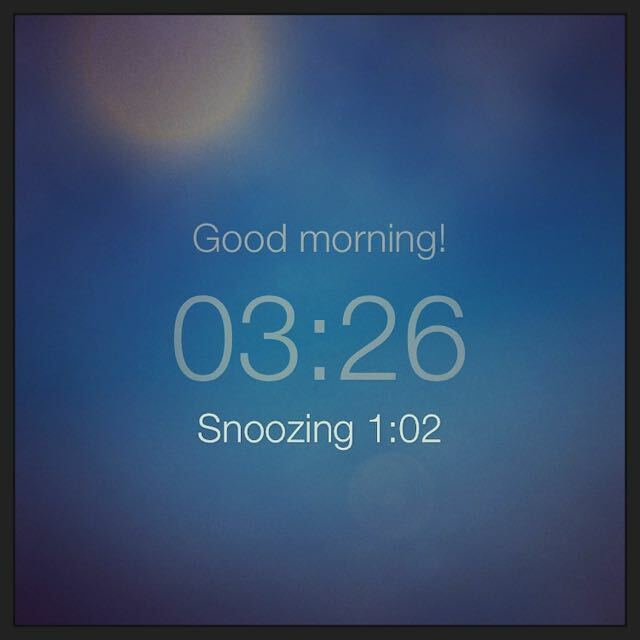 Lack of sleep? Too much food before the race or a combination of them all? Who knows! I’ll need time to reflect on this but am determined to try and find the cause and put it right for the next time I line up on the start line of an ultra. That’s right I will be back for more and this race has given me and even greater love for the sport of ultra running. You hear lots of people talk about “Strength Through Adversity” but this is definitely what I have taken from this race. Final word goes to the race organisers Positive Steps. What a totally superb race! 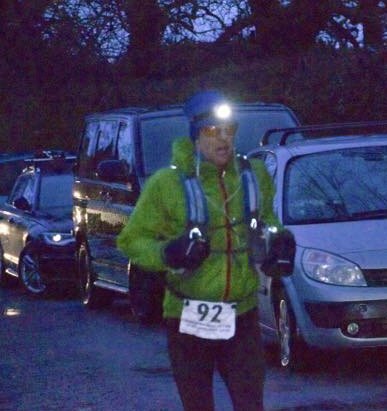 Extremely well organised and marshalled, a total blast, I would highly recommend it to anybody looking for a winter ultra. As someone on the Facebook group said, it takes real balls to run a race in those sorts of conditions and I salute you for that too. If anything it added to the experience, the overall enjoyment and sense of achievement at the end. If you have made it this far down the report then I also salute you dear reader for your own endurance effort. Apologies for rambling on but as with all my race reports, once I start typing the stream of consciousness just comes rolling out of the finger tips and its difficult to contain. Feel free to sign off now but if you want a little extra I will quickly share some lists with you on the lessons I have learnt from this race and will take forward and also the kit I used during the day. Thanks for reading and share any thoughts you may have in the comments below. Am welcome to any suggestions regarding the treacle and quads! Never give up regardless of how much it hurts! If you have a crew brief them about the checkpoints ahead of time. Set them a time limit and get them to kick you out of the door! Reduce slightly the amount of calories I consume on the morning of the race or switch some of them to fluid to speed up digestion. This may be a possible cause of the lethargy/treacle? Invest in some waterproof socks or shoes! Look into possible causes of the quad issues and see what can be done to try and avoid them in the future. However don’t over react! This is the first time this has ever happened to me and it could just simply be a one off incident or as a result of a number of other factors outlined above. One pair mitts, windproof gloves and beanie. What did I wish I had with me during or after the race? A compliant body and fit quads! Finally my essential bit of kit has to be my primaloft mitts, my saviours! Great write up. Mine is still only half done but closely resembles yours, not surprisingly. It was certainly an epic second half! My one comment would be not to bother with waterproof socks or shoes; you’ll still end up with water inside anyway that then can’t drain away and that is far worse. As long as your shoes and socks fit well and you take care of your feet it shouldn’t cause any problems having wet feet. I don’t even tend to notice it these days. Thanks Darren, really look forward to seeing your report once completed. Feel free to publish a link in the comments here as am sure the people reading this would love to read yours. Am sure we will all be writing along similar themes – snow, mud, snow, snow, mud, sand, finished! Good point on the socks and shoes and those are exactly the reasons I have avoided them to date. I guess the fact I managed to run 30km+ with sopping wet feet and no ill effects goes to confirm your point, that good fitting shoes and socks are better in those instances. Thanks for the advice! Not sure about next year yet. So many races I would love to do but as you will have seen, I have unfinished business with this race so you never know. How about you? What’s your next race? Well done Gilo, there’s nought wrong with posting the goals beforehand.We all have our reasons for doing this stuff,mine is to finish as high up the leaderboard as I can.but not to take it as anally as you do in triathlon. You recount the day very well , keep up the good work. I wouldn’t coach anyone in any sport, but you’re spending way too much time in the checkpoints. You could have saved 30 minutes on your race time. 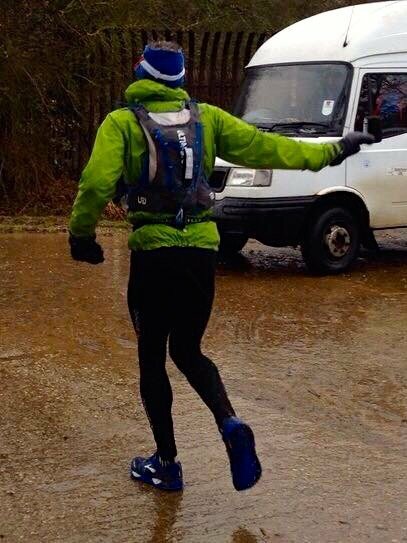 if you decide to go 100 miles and you need a support runner etc,i’ll offer if i’ve got nought else on.